Chocolate Bouquet - Lady In Waiting Fuschia Pink is hand crafted and arranged within a colour coordinated presentation box  no vase required! The free standing box vase, encloses two dozen long stemmed chocolate buds contain only the finest Lindor Lindt chocolate truffles. Chocolate Bouquet - Lady In Waiting Fuschia Pink is a bouquet brimming with chocolates is such a unique and lovely idea. 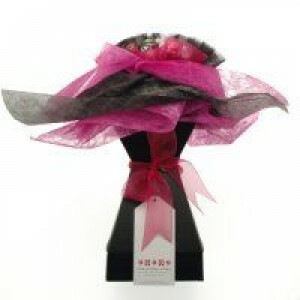 This modern arrangement in fuschia pink and black is the perfect gift for any lady or Yummy Mummy in your life! Also the perfect gift for your colleague who is going off on maternity leave - For the lady in waiting, a bouquet brimming with chocolates! The nursery is ready, the baby clothes are awaiting, what better way to while away the days waiting for the new arrival than a chocolate bouquet to nibble on. Chocolate Bouquets are hand crafted and arranged within a colour coordinated presentation box  no vase required! The free standing box vase, encloses two dozen long stemmed chocolate buds contain only the finest Lindor Lindt chocolate truffles. Contains one dozen dark chocolate truffles. Contains one dozen dark chocolate and raspberry truffles. Currently we are only able to deliver chocolate bouquets to mainland UK addresses but we are working hard to extend our distribution outside the UK. Subject to availability we reserve the right to substitute the above mix with different chocolates from time to time, but will always ensure they are of equivalent quailty and value. Please enter your message into the comments box at chexckout if you would like us to write your gift card.